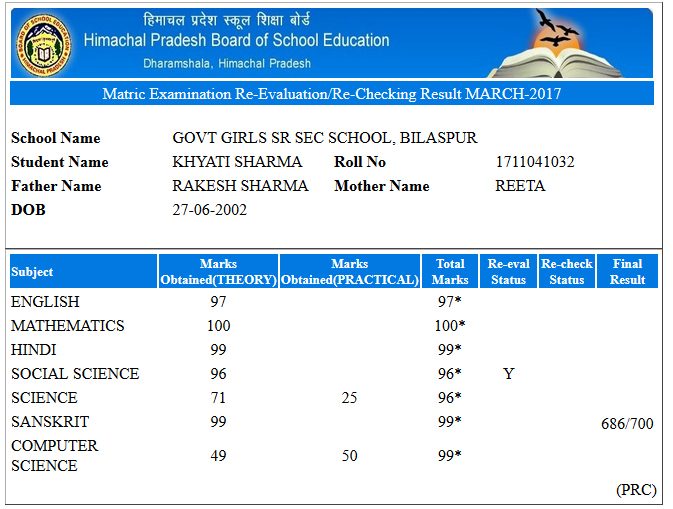 A student of Government Senior Secondary School (Girls), Bilaspur, Ms. Khyati Sharma, has made it to the Matric merit list of Himachal Pradesh Board of School Education after having attained an increase of 5 marks post re-evaluation of her answer sheets. Khyati, who had been awarded a total of 681 marks out of 700 in the HP Board 10th standard results declared on 8th May 2017, was not satisfied with score. She was much confident that she had actually been awarded marks lesser than what she had attempted in the exams. Making her parents aware of the same, she applied for re-evaluation of answer sheets. The re-evaluation results, which were declared yesterday, proved Khyati right when her exam score increased by 5 marks totaling up to 686 on 700. Not just her score increased, she also made it to the HP Board 10th standard merit list securing 8th position in the merit list. Khyati gives the credit of her success to her parents, Mr. Rakesh & Mrs. Reeta Sharma, who always supported her during studies & exams and even backed her in her decision of applying for re-evaluation having complete faith in her. “It is a moment of extreme proud for all of us. We were happy when we came to know that Khyati has secured 681/700 but are even happier to see her making it to the merit list securing 8th position. We are proud of our daughter. Given her hard-work and dedication, this result is what we had already expected.” says her father Sh. Rakesh Sharma, who is himself a Lecturer in Mathematics. Khyati has made both her parents proud by having scored 100 out of 100 marks in mathematics. She had special inclination for mathematics given that both her parents are from mathematics background. “She has managed her study schedule in such an efficient manner that we never had to supervise her studies. I am sure that the balance between study and other activities helped her to achieve this result” – adds her mother Mrs. Reeta Sharma who happens to be a post-graduate in Mathematics. Inspired by Ms. Mansi Sahay Thakur (Former deputy Commissioner, Bilaspur), Khyati too plans to be a successful IAS officer serving the country in the best possible manner. Team HimBuds wishes Khyati all the very best for her future endeavors. 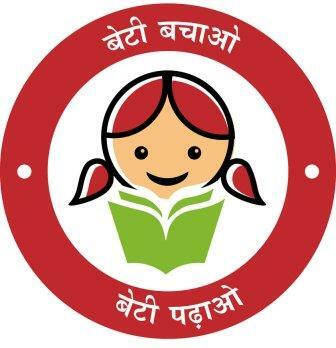 She has proven to be the real brand ambassador of Beti Bachao, Beti Padhao. Having been a student of a government school, she has also broken the myth that only convent or private school students can do well in studies. Effort & Dedication is what all it takes to be successful. Congrats Khyati.